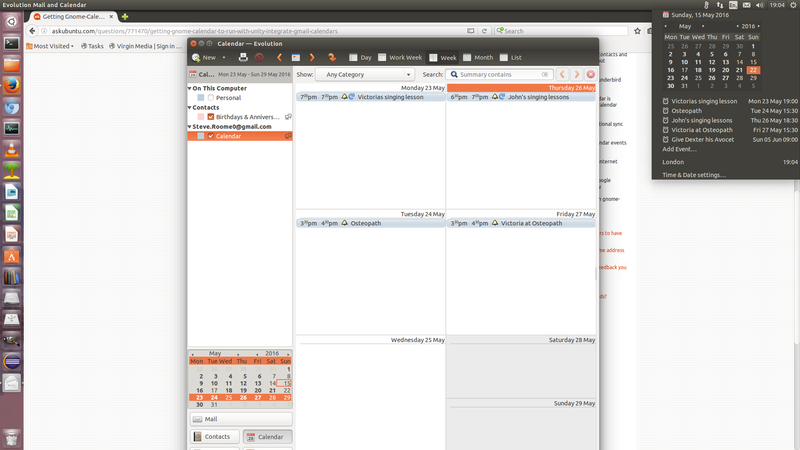 I upgraded Ubuntu to 16.04 and came across the calendar application. However, in tutorials I found online I could see people integrating gmail accounts from the calendar settings menu. I could only see a link to "Online Accounts". There I can add my gmail account, but there's no way to select the calendar application in the "The following applications integrate with your Google account". However, after I installed the gnome "user interface" and the gnome-shell (sorry for using the wrong lingo, it's my first time doing this), I could see the new option in the calendar settings. I did that and it worked well. However, I was so frustrated with gnome (several apps crashing multiple times, work spaces lackluster, pixel bugs and finally a failure of locking the screen using a hotkey, no matter whether I install xscreensaver on top of lightdm or not), that I went back to Unity. Now in Unity, my Calendar app still has the google entries that it used to have before (so something is apparently working; but whether they will be updated/refreshed I am not sure), but Calendar Settings still doesn't give me the option of integrating gmail and other calendars. How do I get that functionality? It can't be that I have to change back to the gnome UI, can it? Install Evolution. It synchronises with Google calendar and integrates nicely with Unity. Here is a screenshot showing my desktop. I have the Evolution calendar open displaying appointments from Google calendar. I have also just clicked on 22 May 2016 in the Unity calendar at the top right and it is showing my next 5 appointments in Google calendar on or after after that date. If you want the easiest method, just install gnome-control-center via sudo apt install gnome-control-center. Start it with gnome-control-center online-accounts and add your google account. On the right side, you can activate the Google cloud for as much as you like, not only the calendar. Google Drive is also an option and turns up as a server icon in the unity launcher. But for the calendar, a simple calendar is enough now to give you the synchronized Google calendar. This should work with all calendar programs of your choice. You could try making google applications the default in the system. But I think what you are looking for is something along the lines of integration. Not the answer you're looking for? Browse other questions tagged unity gnome evolution calendar or ask your own question. How to integrate Gmail, Google contacts and Google calendar into Unity without Thunderbird or Evolution? How to integrate Google contacts and calendar in Ubuntu 15.10? How to sync gnome-calendar with an online calendar? How to open the default calendar when clicking on an event in the Gnome Notification Area? How to remove Calendars from Gnome Calendar?